Found along the posterior edges of the thyroid lobes inside the thyroid capsule, there are 2 pairs (superior and inferior) of small endocrine glands. They seem as small yellowish-brown bodies. The parathyroid glands secrete a hormone, which keeps blood calcium level by marshalling the calcium from the bones called parathormone. Its activity is opposite to that of calcitonin secreted by the thyroid. 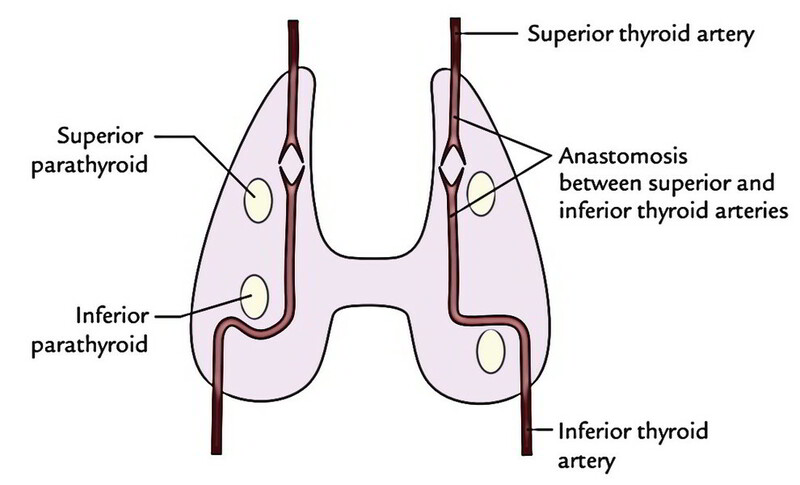 The superior parathyroid is located above the level at which inferior thyroid artery crosses the recurrent laryngeal nerve, at the middle of the posterior border of the thyroid lobe. They are also referred to as parathyroid-IV because they grow from the fourth pharyngeal pouch. The inferior parathyroid is located on the posterior border of the thyroid lobe near its lower post, below the inferior thyroid artery. They grow from the third pharyngeal pouch, therefore also referred to as parathyroid-III. They’re small, oval or lentiform in shape. Every gland measures about 6 millimeters in length, 4 mm in breadth and 2 millimeters in thickness, the magnitude of a split pea and weighs about 50 mg. The parathyroid glands have abundant blood supply. The superior parathyroid is supplied by the superior parathyroid artery, a branch from anastomotic artery joining the superior and the inferior thyroid arteries, or from inferior thyroid artery. The parathyroid glands are supplied by the sympathetic fibres, originated from the superior and middle cervical sympathetic ganglia or sympathetic plexus around the inferior thyroid artery. These fibres are vasomotor in nature. The secretory activity of the gland is controlled by blood calcium level; low level of calcium sparks secretion on the other hand high levels of calcium inhibit the secretion. The parenchymal cells of the gland create irregular anastomosing cords or groups of cells. The parenchymal cells are of 2 types: principal or chief cells and oxyphil cells. The chief cells create the major population and secrete parathyroid hormone named parathormone. The oxyphil cells create modest population and their function isn’t understood. The parathyroid hormone plays a significant part in calcium metabolism. Enriching the mobilization of calcium from bones by osteoclastic action. Raising the reabsorption of calcium by proximal renal tubules. Encouraging the absorption of dietary calcium from small intestine. The inferior parathyroid gland grows from the third pharyngeal pouch alongside thymus. As the thymic diverticulum migrates inferiorly in the neck, it pulls inferior parathyroid by it. As a result, the inferior parathyroid comes to be located eventually on the posterior surface of the thyroid lobe near the lower post. 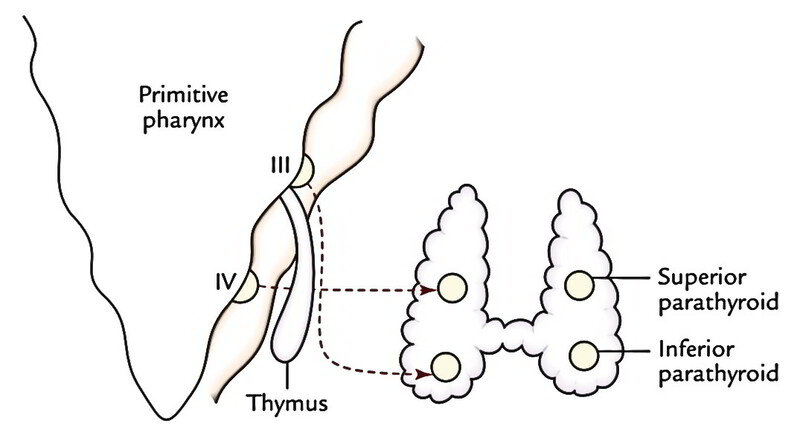 The superior parathyroid gland grows from the fourth pharyngeal pouch and eventually is located on the posterior surface of the thyroid lobe in the level of the isthmus. Hypoparathyroidism may take place spontaneously or because of inadvertent removal of parathyroid glands during thyroidectomy. It ends in tetany because of low blood calcium level. Medically the tetany presents as increased neuromuscular excitability, causing convulsions and carpopedal spasms. Hyperparathyroidism is observed in the tumors of the parathyroid glands. The increased amount of parathormone: (a) removes excessive calcium from bones, which really makes the bones soft as a result of decalcification resulting in a clinical condition termed generalized osteitis fibrosa and (b) may cause formation of stones in the kidney.